The Boston Red Sox’s David Ortiz follows through on an infield single. David Ortiz claps his hands during an at-bat. Baseball is changing. I suppose that’s nothing new — baseball has always been changing, but now novel technologies and team philosophies are reshaping the game to a near-unprecedented degree. Pitch tracking, new kinds of defensive positioning, hyper-specialized relief pitching — all are altering the tactical landscape of MLB. FiveThirtyEight’s season preview is about some of those changes. Tons of season previews concentrate on the teams — our friends at Grantland have been doing a great one of these — so we looked elsewhere for our inspiration. Below you’ll find three of the season’s most important trends alongside three of the players likely to be affected by them. These are the storylines worth keeping an eye on in the 2015 season regardless of your rooting interest. Embrace the change. If you prefer strikeouts to singles, there’s nothing to be worried about. But if you’re partial to the offensive side of baseball, this season may challenge you. Runs per game fell to a 20-year low last year. Batting average is down to levels not seen since shortly after the pitcher’s mound was lowered. You could call this the era of the Three True Outcomes — home runs, walks and strikeouts — but even home runs and walks are markedly decreased. We’re really in the age of the strikeout. Early signs point to another small reduction in league-wide offense this year. During spring training, runs per game were lower than they’ve been in at least a decade, a full tenth of a run beneath the mark set last year. Although spring statistics are volatile for individual players, they may provide some evidence of larger-scale trends — there’s a correlation of 0.64 between league-wide spring training runs per game and regular season runs per game. A perfect bellwether for the strikeout era is Cole Hamels, whose variation in Ks from one year to the next is almost entirely due to the offensive state of the league as a whole. He’s basically a control case — over the last eight years, Hamels has been the most consistent pitcher in baseball when you measure him relative to his peers.1 Because his adjusted stats don’t vary, we can concentrate on his raw numbers — strikeouts, walks and home runs. There’s a metric for that called FIP (fielding independent pitching). 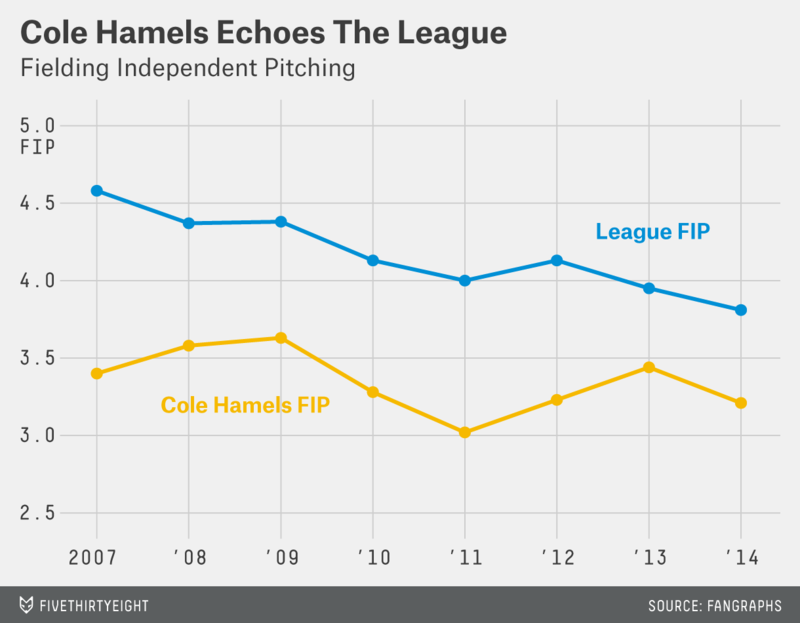 Because Hamels is so consistent, his FIP often tracks the league average. As the league’s rises and falls, so does his. There’s no guarantee the trend of decreasing offense will continue. There’s always the chance that hitters may discover a new method to counter the pitchers’ current dominance. But if that fails, new MLB commissioner Rob Manfred has said it’s a priority to change the rules to better balance the pitcher/batter battle. Offensive numbers are falling for a number of reasons, but none contributes more than a strike zone whose bottom edge is sinking lower and lower. Since at least the introduction of a PitchF/X grading system in 2009, umpires have been calling a larger and lower strike zone. Pitchers noticed, and have thrown an ever-greater proportion of their pitches at knee height. Meanwhile, the league’s hitters have been reduced to feebly hacking at low balls and producing an endless string of ignominious groundouts. But a curious thing happened in the second half of last season: After years of sustained decline, the average pitch height bottomed out at about 2.25 feet. 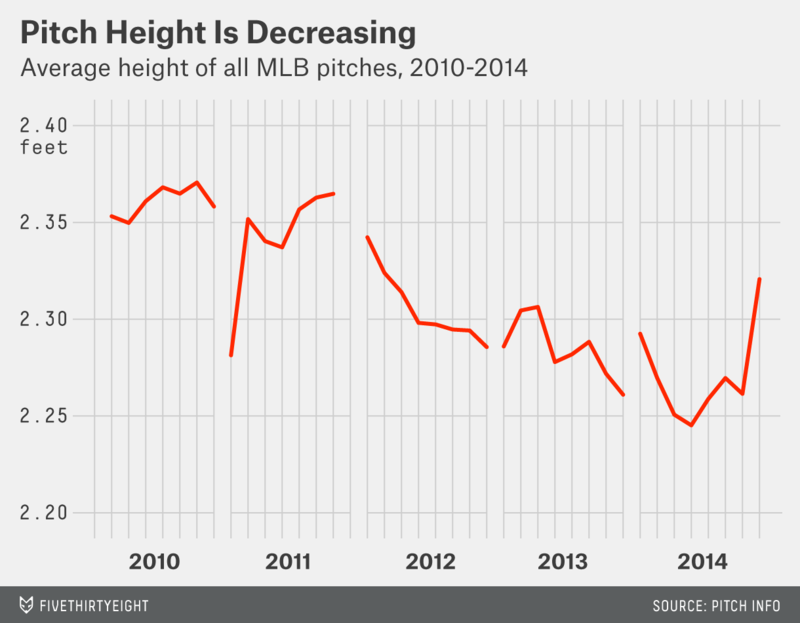 Soon after, during the playoffs, average pitch height suddenly rose to a place it hadn’t been since 2011. It was too drastic an increase to be the result of chance alone, and an analysis of ball/strike decisions confirmed that umpires were calling pitches in an unusually old-fashioned manner. Was this a playoff aberration, or the beginning of a correction? Keep an eye on Billy Butler to find out. Despite his entertaining playoff run last year, Butler struggled in the regular season, notching a -0.6 WAR, about equal to what some triple-A replacements might do. Part of his woeful hitting was due to his performance in the bottom third of the strike zone, where he hit .278/.307/.394 and grounded into 12 double plays. Butler is uniquely harmed by the low strike zone because of his poor plate discipline and sluggish speed, which turns most grounders into outs. If the low strike evaporates, Butler may see his fortunes turn (this is a scenario Oakland A’s general manager Billy Beane, who signed Butler to a contract in the offseason, may be banking on). Balls higher in the strike zone can be more easily turned into flies, and that is where Butler does his damage (he slugged .472 on fly balls). If you don’t want to dive into a trove of Pitch F/X data, Butler’s early season production can serve as a barometer of the strike zone instead: If he’s launching balls high into the outfield, the strike zone may be rising. If he’s attempting to leg out infield singles to poor effect, the zone may still be at its low point. So far this year, spring training has seen an average pitch height of 2.29 feet,2 lower than the playoff spike but higher than it was at any time in 2014. As if the strike zone’s expansion wasn’t enough to make batters uncomfortable, this year MLB has instituted a new rule limiting the ability of the batter to step outside the box between pitches. Prompted by concerns over the ever-increasing length of modern MLB games, the change is meant to speed at-bats along by preventing hitters from engaging in interminable glove-adjusting rituals. David Ortiz has already decried the rule, but will it actually change his performance? Ortiz was one of the worst offenders last year, ranking 16th in the league in seconds per plate appearance.3 Ortiz claims that the time spent outside the box is useful to the batter, and there may be something to that statement. Some consistent relationships exist between average batter pace and offensive statistics,4 and those correlations hold even after correcting for the age of the hitter (older hitters take much longer, on average). Still, it’s impossible to know for sure whether the relationships are ones of causation or correlation. In other words, good hitters may be good because they take a long time, or they may take a long time because pitchers are stalling in order to decide how best to challenge them. What’s more, pitchers seem to control the pace to a much greater extent than hitters do, and hurlers also seem to prefer more leisurely at-bats. We can’t draw any simple conclusion, at least not on a league-wide level. The 39-year-old Ortiz is a player for whom time is especially important. Big Papi has so far managed to elude the normal course of decline. He has survived an era that has become ever more hostile to hitters, watched as the strike zone tumbled and is now confronted with yet another challenge of pace. If he and the other slow sluggers struggle this year more than expected, we may yet realize that pace is more important than we thought. The standard deviation of his fWAR in these years is .465; the pitcher with the next lowest, at .668, is Rick Porcello. I limited this analysis to those starting pitchers who made appearances in at least five of the last eight seasons. This information is courtesy of Harry Pavlidis and Pitch Info. Using data from FanGraphs, limited to batters who’ve met the minimum of 3.1 plate appearance per game (“qualified batters” in baseball lingo). More specifically, r=0.2 between pace and ISO; r=0.1 between pace and OBP, both of which are statistically significant.